At the water’s edge in Yokohama, Japan, is one of the most important early examples of what has been described as “digital architecture”. In other words, it is a building not just designed with the help of computer technology, but which is so complex it could only have been designed using computers. Conventional drawing techniques would have been simply too crude to allow the creation of accurate construction drawings. The fact that it happens to be a transport building makes it all the more pleasing, and demonstrates once again the impact that transport has had on the built environment. It’s the Yokohama International Port Terminal. It’s a building of different aspects, presenting varying faces according to how it is being looked at and what it is being used for. On the top (as seen in the photo above) it seems to a visitor like a city park and the fact that it is a three-storey building (two above ground, plus a basement level) is hard to appreciate. Inside the terminal is a series of extraordinary spaces the design of which would have been impossible only a year or two earlier. 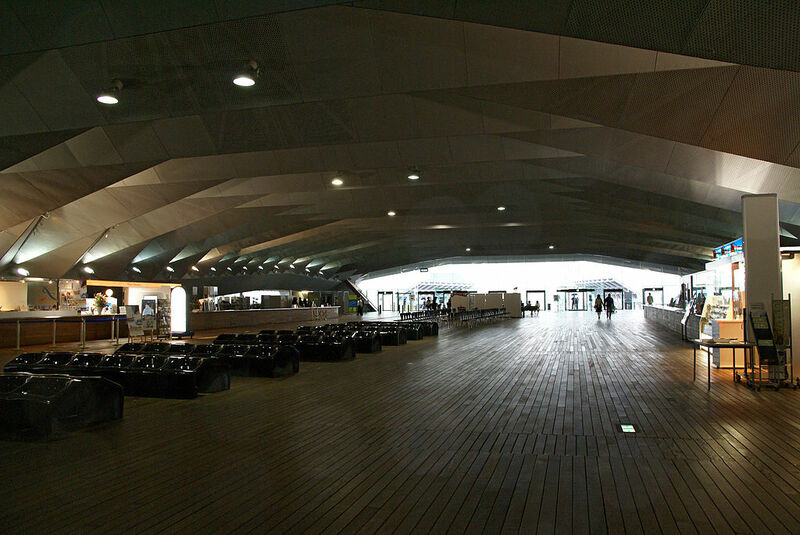 Yet when approached by ship (it is the major cruise ship terminal for Yokohama) it looks like a more conventional terminal building. Completed in 2002, the terminal is the work of Foreign Office Architects, and it remains arguably the practice’s most famous building. Osanbashi Pier had been the site of several previous terminals. The previous building, which looks a bit like an upside-down ziggurat, wider at the top than the bottom, is still there but is now used as offices. For the new terminal, Foreign Office Architects was determined to avoid the traditional building-on-a-pier approach which had characterised most port terminal buildings until that time. Instead, it used computer modelling to create a deconstructivist building in which surfaces are intricately folded to create multiple planes at different angles, and the building’s structure flows from one part into the next without particular defining transition points. “Blobs” is perhaps a little harsh to describe the type of building for which Yokohama International Port Terminal set the precedent. What the book means is buildings of extreme form like the Hungerburgbahn stations and in terms of non-transport buildings (such things do exist, apparently) the “Bird’s Nest” Olympic Games stadium (Beijing, China) and the Walt Disney Concert Hall (Los Angeles, USA). 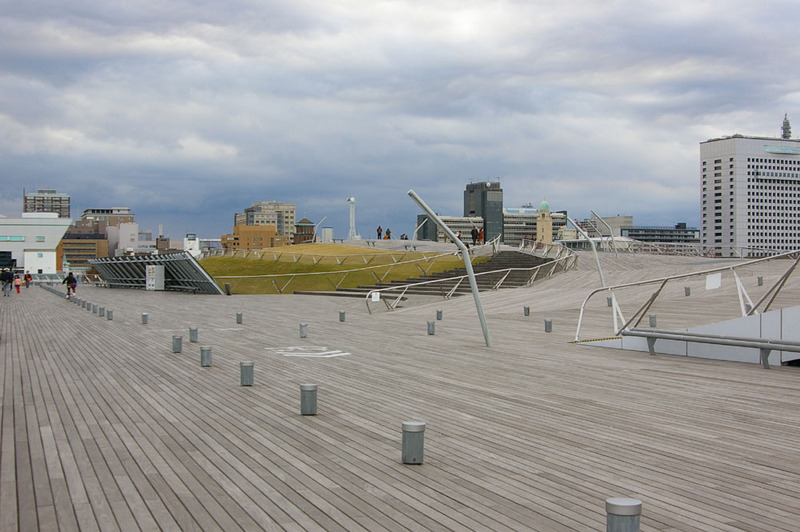 The Yokohama International Port Terminal is intended to be part of the urban fabric, rather than a building with a single transport purpose, ensuring the building has more life than it would otherwise, and guaranteeing its use even when ships are not actually boarding or disembarking their passengers. It not only contains all the necessary handling facilities for international ship passengers, but also shops, a conference centre and a 600-space car park. On top, the creation of a new urban park was a key driver for Foreign Office Architects. And what a park it is. It takes that quintessential waterfront structure, the boardwalk, and warps it in ways only imaginable thanks to digital design. 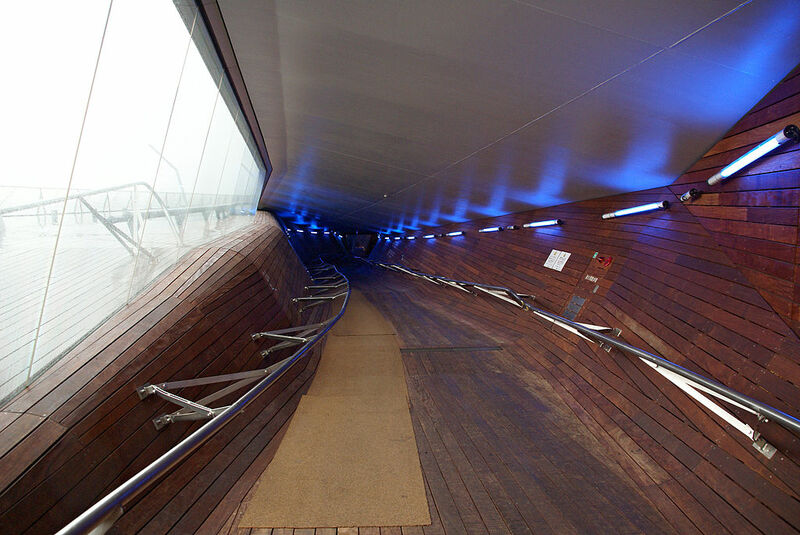 Regular boardwalks are long, flat and straight. This one swoops and dives over undulations that reflect natural topography. Areas of grass, seating and shade-giving parasols, combine to form a very nautical take on the idea of the urban park. Within that park are sloping valleys that lead down to the inside of the building. Here, extraordinary rooms with amazing details like folded metal roofs can be found. Indeed, the folds and slopes of the building are the secret to its construction. They transfer the forces diagonally within the building, and along with some cleverly hidden concrete girders, allow the creation of rooms that do not have visible pillars intruding into the internal spaces. According to several sources, the diagonal elements are also helpful in ensuring the building is proof against seismic activity. The materials used are consistent throughout, and come from a very minimalist palette. The decking of the roof-top park flows through into the internal spaces where, shined to an appropriately nautical standard, it can be found on floors and walls. The handrails and their branched supports are the same outside and inside, connecting the interior and exterior of the building together. Foreign Office Architects planned the circulation routes through the building as a series of interlocking loops. The standardised details tie everything together, but the concept of circulation loops moves the experience away from the linear progression typical of many large transport facilities. Thanks to the digital architecture buildings which followed it, the Yokohama International Port Terminal seems less radical to today’s eyes than it did only 12 years ago. That shouldn’t lessen the importance of the building not just to the story of transport architecture, and the impact transport infrastructure has on cities, but on architecture in general. 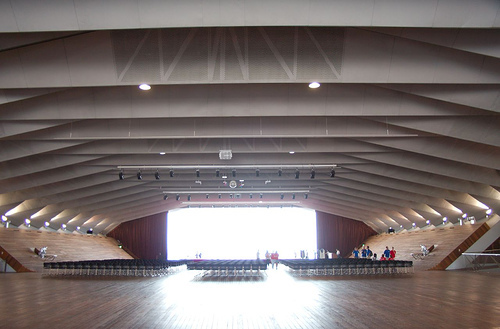 It won several prizes, including the Royal Institute of British Architects’ 2004 Worldwide Award. Foreign Office Architects was wound up when its principals Alejandro Zaera Polo and Farshid Moussavi went their separate ways. 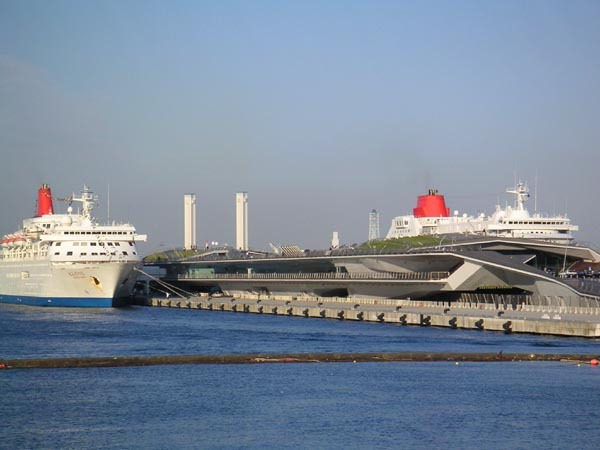 They both now have practices of their own and you can see the official project pages for the Yokohama International Port Terminal here and here at those practices’ websites. ¹ Jones, D (2014) Architecture: The Whole Story, London: Thames & Hudson, p. 526.